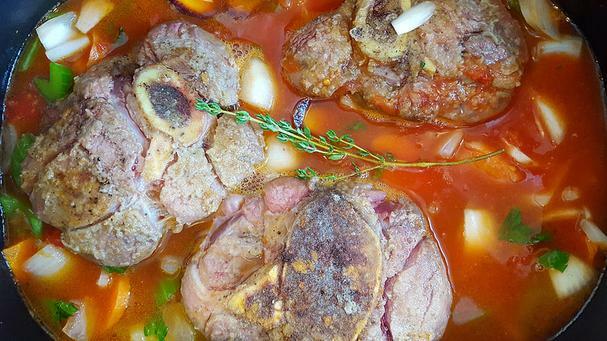 Ossobuco, a Milanese dish of veal shanks braised in white wine, broth and vegetables, is one of the most renowned dishes in Italy. It’s typically served with a fresh and zesty gremolata - a simple and flavorful condiment of lemon zest and finely chopped garlic and parsley - and served with risotto, polenta, creamy potatoes, or wide buttery noodles. This hearty and satisfying meal is perfect any night of the week, especially when cooked in the slow cooker. It's easy and so elegant! Thoroughly season the veal shanks on both sides with salt and pepper. Dredge in flour, shaking off the excess. Heat a couple of glugs of olive oil (2-3 tablespoons) in a skillet over medium-high heat. Sear on both sides until golden brown. Transfer to the slow cooker. Add the wine to the skillet and continue to cook, scraping up the brown bits from the pan. Pour into the slow cooker. Add the can of tomatoes with their juice, chicken stock, chopped vegetables, and thyme to the slow cooker. Cover and cook on low heat for 6-8 hours or until the meat is tender and falling off the bone. 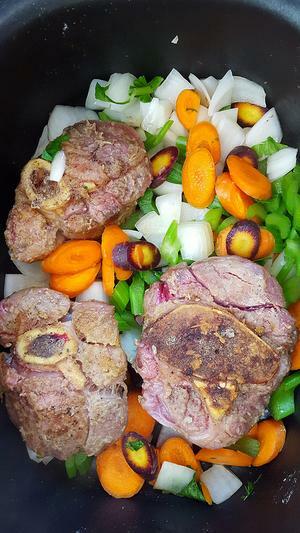 Remove the shanks from the slow cooker and keep warm. Transfer the sauce to a large skillet and simmer over medium-high heat until reduced and thickened to your likeness, about 10-15 minutes. 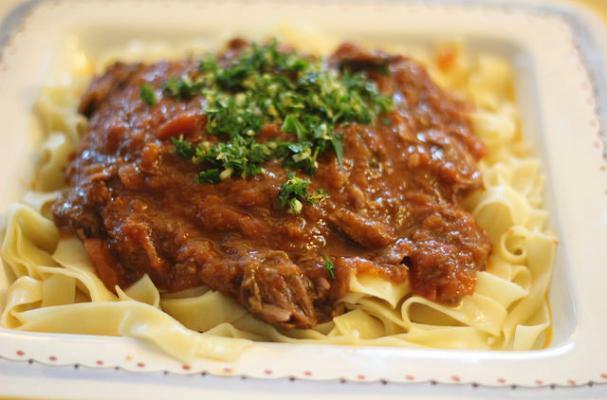 Transfer sauce to a platter, top with shanks, and serve with gremolata spooned over the top. Note: if the meat has fallen off the bones then simply discard the bones and place meat in bite-size portions on the platter (as shown at top). Above: ready to start cooking!